This oil is wonderful for all skin types. It is an emollient which contains vitamins A, B, E. It helps the skin retain its moisture and smoothness, reduces skin irritation and inflammation, and also has the ability to lighten the dark areas in the skin. Not only does it give great effects on the skin, it also nourishes and conditions the hair; keeping it strong and shiny. 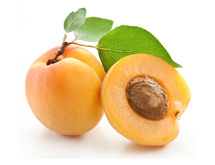 Apricot Kernel Oil is rich in many vitamins, such as vitamins A, D, and E which can easily be absorbed into the skin. It is a great moisturizer for mature, sensitive skin. It also helps the skin retain its elasticity and clarity, and acts as an anti-inflammatory and cooling effect for skin problems and burns. Avocado oil contains vitamins A, B1, B2, D, and E. It is nourishing as well as moisturizing and helps rejuvenate the skin. 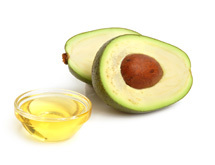 Avocado oil is easily absorbed into deep tissues relieving dryness and any other skin problems. It also helps increase collagen levels in the skin which fights the formation of wrinkles. It is a great and effective moisturizer for all skin types. 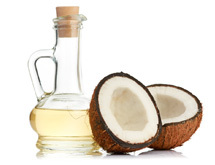 Coconut oil is easily absorbed by the skin creating a smoother, softer and healthier appearance. Not only does it protect and improve the condition of the skin but it also helps reduce dryness and stretch marks. It is an excellent conditioner, providing essential proteins which helps in the re-growth of damaged hair. Coconut oil keeps the hair healthy and shiny. 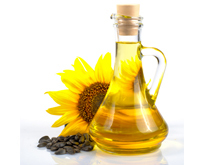 Sunflower oil helps moisturize, regenerate and condition the skin. It contains high levels of vitamins A, D & E. It is suitable for all skin types and helps prevent skin damage. It is a liquid plant wax, which is closest to our natural skin serum. 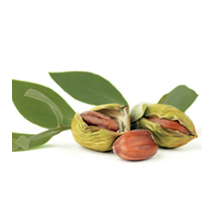 Jojoba oil contains vitamin E, which works effectively as a moisturizer and is easily absorbed by the skin. It treats dryness and creates a more youthful appearance. It also promotes hair growth and improves the health of the scalp. It can also be used as a deep hair conditioner. 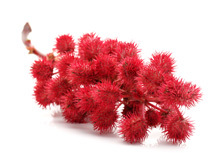 Castor oil is an effective moisturizer and emollient for the skin. It is used as an anti–wrinkle treatment, has effective lightening on the skin and gets rid of stretch marks. 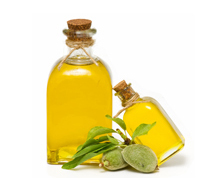 Castor oil can calm the skin from inflammation and irritations. It is also a great component for hair growth; it improves the quality of the hair, prevents hair loss and solves dandruff problems. Its benefit for the skin was well known among ancient people. It moisturizes and regenerates skin cells. It is very gentle on the most sensitive skin. 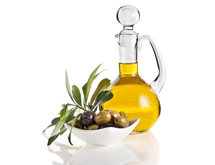 Olive oil contains four major antioxidants which allow it to work as a cleanser, moisturizer, and protector of skin. Among these antioxidants are vitamin A and vitamin E. Vitamin E partly accounts for the anti-aging benefits of this substance because it helps restore skin elasticity and prevents skin aging. It is an excellent conditioner for the hair and scalp. It helps promote healthy, shiny and silky hair. It also strengthens the hair and prevents hair loss. This oil has the highest content of protein and the richest source of vitamin A, D, E. It has excellent emollient properties which help in moisturizing and conditioning the hair. 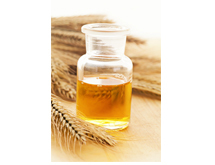 Wheat germ oil prevents hair breakage, promotes new hair growth and it also has a role in repairing damaged hair. 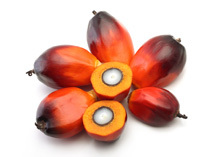 Palm oil has moisturizing and healing properties, containing very high levels of vitamins E and A making this oil beneficial for dry, sun damaged and premature aged skin. It is also great for the hair. It helps nourish the roots and scalp and acts as a great deep conditioner. Referred to its beauty benefits, it is called “woman’s gold” in Africa. It is high in vitamin A and E making it an excellent, effective moisturizer. It retains skin moisture and elasticity, which is used to help heal dry, cracked and itching skin. 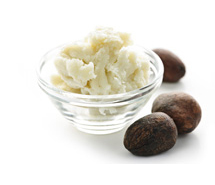 Shea butter also has the ability to reduce stretch marks and wrinkles by promoting cell renewal. 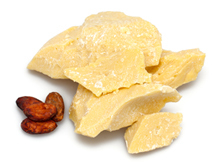 Cocoa butter is a great moisturizer, containing vitamin A, C and D. It is easily absorbed by the skin. It is also used to treat dry, itching skin and helps prevent stretch marks, and helps keep the skin protected and hydrated. Cocoa butter helps relieve some skin problems. 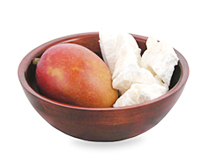 Mango butter is an excellent moisturizer for all skin types. It helps restore skin elasticity, flexibility and reduces stretch marks. Mango butter contains vitamins A, C and D. It also has many antioxidant properties that help protect the skin from sun damage. It is the finest moisturizer with excellent emollient properties. It is also extremely mild and gentle on the skin. Goat milk contains many vitamins, such as vitamins A, B, C, D and E. The PH of goat milk is much closer to human PH, which makes it suitable for all skin types. 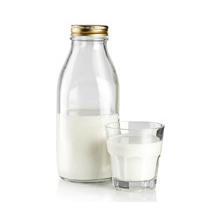 Goat milk reduces inflammation and has non-irritating properties. It also prevents redness and sooths most of the skin problems. Goat milk contains lactic acid that removes dead skin cells and naturally rejuvenates the skin leaving it hydrated, fresh and protected. Coconut milk has great soothing properties. It contains vitamins A, C and E which makes it an excellent moisurizer for the skin. Coconut milk helps to relieve dry, rough skin, and has the ability to calm and hydrate it. It is also full of antioxidants, which helps protect the skin. 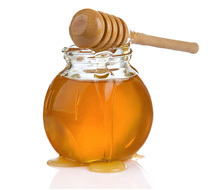 Nature’s ultimate beauty product, honey helps the skin look youthful. It is rich in vitamins, minerals and amino acid making it an effective moisturizer and humectant. It is also a natural antioxidant, which helps protect the skin from sun damage. It also supports the skin’s ability to rejuvenate new cells. It also has anti–inflammatory properties. Honey helps speed up the healing process of some skin problem, such as burns and wounds. Essential oils are natural aromatic compounds found in the flowers, seeds, stems, roots and herbs. It contains the essence of the plant and all its healing powers. It is highly concentrated and gets absorbed easily by the skin. In addition, all essential oils have possessed antiseptic, antifungal, antiviral and antibacterial properties. Store your essential oils in a cool place out of direct sunlight. Essential oils are not for internal use. Because of their high concentration, always dilute the essential oil with suitable carrier oil before applying on your skin. Such as sweet almond oil, apricot kernel oil, olive oil, avocado oil and jojoba oil with a percentage between 1% - 2%. Ex 1% = 3 drops of essential oil in one table spoon of carrier oil, 2% = 6 drops of essential oil in to one table spoon of carrier oil. Stimulating scent, improves circulation, increases energy, reduces headaches and irritability, and fights viral, fungal, and bacterial infections. Helps to reduce acne, general tonic, cleaning, promotes hair growth, improve circulation and fights cellulite. Wonderful oil for all skin types, including dry, oily, blemished, sensitive, and mature skin. Soothes irritation, rejuvenates skin cells and kills bacteria. This soothing oil reduces stress, relaxes muscles, and helps you sleep. Reduces stress and acne. It fights skin pigmentation. It has astringent properties, detoxification properties. It kills viruses and bacteria, regulates oily skin, and relaxes stiff muscles. general cleanser, good for acne and fights cellulite. It is an immune system tonic, and has astringent and toning properties. It also reduces stress and anxiety. Contains rejuvenating properties, it also helps in reducing stress, fights cellulite and is anti-infectious. 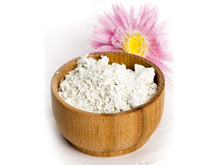 Astringent properties make it especially good for oily or acne prone skin and dull hair. It could also be used as a natural deodorant. Treat muscle fatigue and stiffness. It helps fight cellulite. It can be used as a treatment for acne. It can help in fluid retention and mental exhaustion. It has antiseptic, disinfectant and detoxification properties. Bright and fragrant oil that reduces anxiety and depression, improves blood circulation, rejuvenates dull skin, detoxifies, fight cellulite, and is a gentle antiseptic. Treats muscle pain, helps eliminate toxins and is good treatment for acne. It improves circulation, fights cellulite, and promotes new hair growth, has anti-aging properties, and is antiseptic. Anti-infectious, antiseptic and has a fresh and cooling effect because it contains menthol. It has muscle relaxing properties, improves oily skin and treats acne, improves circulation and mental tiredness. It contains anti-infection, antifungal, anti- inflammatory properties. It treats rashes, dermatitis and is a good treatment for acne. It contains antiseptic, antifungal, anti-factious and anti-inflammatory properties. It also fights bacterial skin infections. This refreshing oil used to relieve anger, tension and depression. It can also help to relax and sooth tired muscles. Basil essential oil contains antiseptic, antifungal and inflammatory properties. This oil improves blood circulation and also helps to strengthen hair roots and maintains healthy and beautiful looking hair. This floral scented oil is excellent for mental balance and mental relaxation. It is known for relieving depression, stress and anger. Ylang Ylang essential oil helps in maintaining oil balance in the skin and can also be used as an intensive treatment for hair, leaving it softer and stronger. 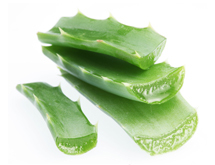 Aloe Vera is a widely used herb because of its medical benefits. It contains anti-inflammatory properties which helps heal burns, speed recovery of skin wounds and treat many other skin problems. It also contains anti-oxidants which protect the skin cells from damage and help to reduce aging. Aloe Vera is also a useful moisturizer, preventing dry and flaky skin. It is also known for preventing hair loss and promoting new hair growth. It is a great moisturizer, soothing the scalp to eliminate dandruff. Aloe Vera also acts as a natural conditioner, restoring hair shine, making it softer and healthier. 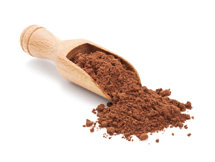 Clays has been used for centuries as a natural agent of skin beauty care because of their unique properties, it contain many minerals such as calcium ,magnesium and potassium .Most clays have the ability to absorb toxins and excess oils, removing impurities , tighten the pores and improves blood circulation and exfoliating dead skin cells . It’s great for skin problems like acne and oily skin. Dark chocolate contains vitamins A, B12, D and E. The level of antioxidant compounds found in dark chocolate is higher than that of green tea. These antioxidants help repair damaged cells and protect the skin. It is well known as a cellulite fighter, by improving the function of the blood flow, keeping the skin hydrated and soothed. It is a traditional Indian beauty ingredient used for many years. Turmeric helps slow the rate of aging, restoring youth. It is a wonderful body scrub, removing dead skin cells, leaving your skin soft, smooth and glowing. Turmeric is known to lighten skin and pigmentation. 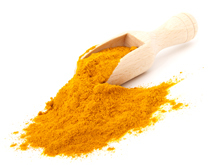 Regular use of turmeric helps the skin ‘tone’ and ‘color’ return to its normal state. Coffee has a number of benefits on your skin. It is a natural and gentle exfoliator. Coffee helps tighten the skin. It is also perfect for reducing cellulite and skin pigmentation. 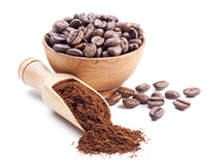 Coffee also treats redness and inflammation. 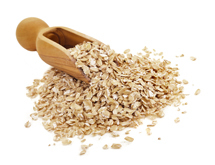 Oatmeal is an excellent, gentle exfoliator, removing dead cells and revealing softer, smoother looking skin. It also assists in reducing dryness by restoring the moisture in the skin. Oatmeal contains a cleaning agent and can therefore be used as a mild cleanser. Well known from the ancient civilizations and is considered a luxury item, myrrh has powerful antioxidants and healing properties which speed up the process of wound healing and prevents bacterial infection. 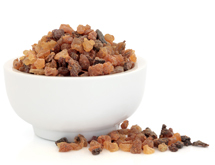 Myrrh is also used to maintain healthy and youthful skin. Myrrh also soothes chapped or cracked skin. Chamomile is well known for its calming and anti-inflammatory effects on the skin. It also has soothing properties which helps reduce skin rashes and minor burns. 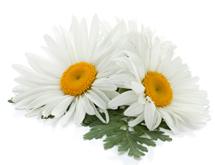 Chamomile’s mild astringency makes it an excellent deep cleanser. Rosemary is one of the most common herbs used in skin care. It contains powerful antioxidants which slow down the rate of aging and help keep the skin rejuvenated. Rosemary oil has skin lightening effect, which helps in naturally correcting skin color. It also stimulates blood flow making the skin healthier. 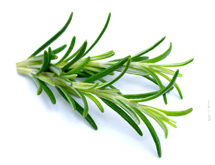 Rosemary encourages hair growth by improving blood flow to the scalp making the hair stronger and shinier. 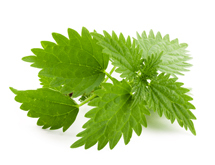 Nettle is a trusted herb for using of reducing hair loss and encourages hair to re –grow. It contains many vitamins A, B, C and some minerals like magnesium and calcium which increases blood flow and nourishing hair roots to produce stronger and healthier hair. Nettle also improve the condition of the hair and reduce dandruff. Calendula is an herbal plant which is mostly found in most in our region. It is best used for chapped and irritated skin. 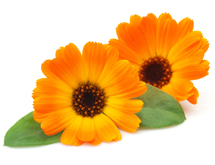 Calendula can speed the healing process of skin wounds and burns. The petals are antiseptic, anti-inflammatory and useful for treating various skin problems. Lavender is one of the most widely, versatile herbs known today and the most common used for its numerous therapeutic benefits like stress and nervous tension. 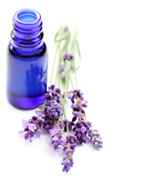 Lavender oil has very powerful antiseptic properties helping to heal wounds and decrease the appearance of scars. 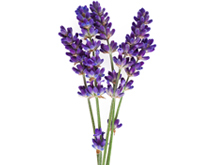 Lavender can also treat some skin problems because of its anti – inflammatory properties. Carrots contain many vitamins such as vitamins A, B, C and E and A in a form of beta carotene. It contains natural antioxidant which slows down the process of aging, fighting the damage of tissue and helps in rejuvenating the skin tissue. 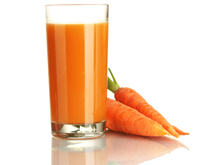 Carrots have anti–inflammatory properties which help condition and tone the skin. 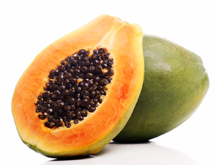 Papaya has become as a leading ingredient in skin whitening products because it contain Papain, natural enzyme that promotes skin renewal and cell turnover. It exfoliates the skin to reveal newer cells. Papaya contains many vitamins like A, C, E and anti-oxidants that help to protect skin from damages and to reduce skin aging. It's also help to treat acne and some skin problems. The Dead Sea salt is historically known worldwide. It contains many minerals like calcium, magnesium, potassium. It can treat some skin conditions such as acne and dermatitis and promote cell regeneration and treat skin dryness by moisturizing and softening the skin. 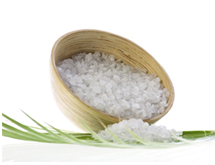 Dead Sea salt has the ability to reduce stress and muscle relaxation. It increases blood circulation and removes toxins from body.